To capture the full likeness, presence and character of a person — not just a flash in time as a photograph might. To create a work of art that is worthy of being treasured by family and friends and is capable of lasting for generations. This fourth point — creating a lasting family heirloom — is one that matters most to me. Below you can read more about the general approach I take, my pricing guidelines and payment schedule. Please contact me for more information. 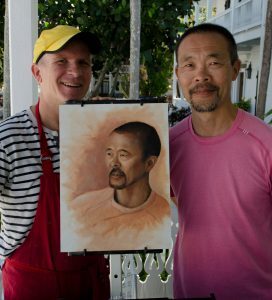 First Meeting: The process begins with a meeting to discuss the portrait you would like to see. We talk about the size and scale of the portrait, its colour schema and composition, your pose, expression and clothing, and the background, lighting conditions and props, if any, that will be included. Pricing and the schedule are also covered. Formal Agreement: When we reach an agreement about these specifications, I formalize it in writing. I will give you a written contract covering the scope and terms of the painting commission. When this agreement is signed and a deposit paid, work begins. First Sitting: In an ideal world, I would paint your portrait entirely from life over the course of 4 – 6 sittings. Unfortunately, few people have the time or inclination to make such a commitment. Therefore, I usually request the subject to sit for me for at least a first session (approximate 3 hours). In that period, I’ll take a series of photos for reference which we’ll review together and agree on the best pose, expression, and vantage point. If time permits, I will also do some quick sketches or colour studies as well. My preference is to have the subject visit my own studio where I can control lighting conditions. But I am willing to travel to your location as well, especially if the environment is important to the painting. Stage 1: Preliminary Drawing: I prepare a simple drawing with charcoal or raw umber on the canvas or panel I will be painting on. The drawing stage gives me a chance to perfect the composition and layout for the painting. I will send you an image of this drawing for your review. At this point, we have complete agreement on the pose and composition and no major modifications can be made. Stage 2: First Painting. I think of this as the mid-way point in the painting. In this stage, I concentrate on expressing values and forms. I model the lights and shadows on the figure and background to suggest three dimensions. Then I slowly build up up layers of colour to convey temperature and mood. From a distance, the painting looks finished, but close up one can see that the brush strokes are prominent, the paints have not been blended and that most of the edges are still hard. Digital photos of the first painting stage will be sent to you for review. Stage 3: Second Painting. In this stage of painting, I concentrate on glazing and final finishes. I mix pure pigment with linseed oil (or another medium) to add subtle colour glazes to the painting and to smooth out surfaces and edges. I will send you digital photos of this stage for you to review. Once the painting has dried sufficiently for transport, it can be delivered to you. Stage 4: Varnishing (optional). After 2-3 months of drying, a painting can be varnished. Varnishing is an aesthetic decision which adds a gloss to the surface of the painting, but I recommend it. A layer of varnish helps protect a painting from dirt, dust and air pollution, as well as mechanical damage (like scratching). It also restores a painting’s original brilliant colours (oil paint tends to become dull and discoloured over time). Varnish also homogenizes (evens out) the final appearance of a painting. Two layers of varnish should be applied. It takes 24 hours for one layer of varnish to dry. Once the varnish is dry, the painting is ready for framing. How much of the subject will be depicted, and how close to life-size the figure is. The addition of “props” such as jewellery, pets, books, newspapers, etc. Below is a list of base prices for portraits painted on panels of different sizes for a single subject that is life-size or near life-size. I’m assuming a simple background and no props and the availability of good quality reference photos (ideally taken by myself). The addition of props or scenery may require an additional 20-50% of the base price, depending on their nature and complexity. This list is intended to serve as a guideline for discussion purposes only. I can accommodate custom sizes and compositions as you wish. The purchase price we agree upon for your commissioned portrait is payable in three (3) equal instalments. The first instalment is a non-refundable deposit that is due upon signing of our agreement. The second instalment is due when the portrait is approximately 50% complete (usually at the end of the First Painting Stage). The final payment is paid on or before the date of delivery of the work. I do want my patrons to be 100% satisfied with the final artwork. If for some reason you are not, I can apply the deposit paid to the purchase of another work by me at any time in the future.